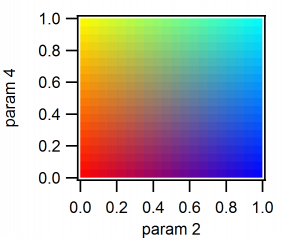 Parameter 2 is the probability if the last game was CD (I cooperated, other player defected). Parameter 3 is the probability if the last game was DC (I defected, other player cooperated). Parameter 4 is the probability if the last game was DD (all defected). The other question is, how many iterations do we play? In fact, it is possible to calculate the average outcome over an infinite number of iterations, using Markov chains. The method is described by Press & Dyson, and it is what I use in this simulation. The catch is that none of the parameters can be exactly 0 or exactly 1, lest the method fail. As we can see from the movie, the population is highly unstable, and continues to change even after a million generations. Below I identify several strategies that are similar to ones with common names. There are also many strategies in the video that don’t have any names that I know of. I was worried that the simulation might be unstable simply because the mutation rate is set too high. So I tried the simulation again, adjusting the payoff matrices so that it would use a different game. First we have Battle of the Sexes. In Battle of the sexes, a married couple is deciding what to do for the night. One prefers to go to the football game, but his husband prefers to go to the opera. However, whatever they choose to do, they both strongly prefer to stay together. In this game, “cooperation” is going with the other player’s preference, and “defection” is going with one’s own preference. Each simulation appears to settle on a relatively stable equilibrium, but interestingly different simulations show different equilibria. The first simulation shows a population that likes to take turns, while the second simulation shows a population that likes to hold on to dominance as long as possible. Second we have Stag Hunt. Two individuals go on a hunt. Each can choose to go after a stag (cooperate) or after a hare (defect). Going after the stag offers the biggest payoff, but only if both players choose to hunt the stag. If only one player hunts a stag, then they fail to catch anything, while the other player catches a hare. It seems that the population settles on hare hunting. However, on repeated simulations, sometimes they settle on stag hunting. 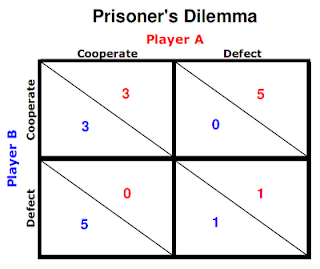 The Iterated Prisoner’s Dilemma appears to lead to an evolutionary trajectory marked by instability. This instability is particular to the Prisoner’s Dilemma; similar simulations of Stag Hunt and Battle of the Sexes lead to more stable populations. Of course, it’s plausible that with different simulation settings and procedures, the population could eventually settle in a stable state. This has been shown in some of the literature. Creating this simulation gave me an appreciation for how difficult this problem is, and why it is the subject of an entire field of research. How about a link to the source on GitHub? No link, because I’m partially pseudonymous. (Yeah yeah, I linked to my Youtube channel, whatever.) I won’t stop you from finding the code with Google, but I should warn you that it’s coded in Igor Pro. “Partially Pseudonymous” would be a good name for a band. That is all.